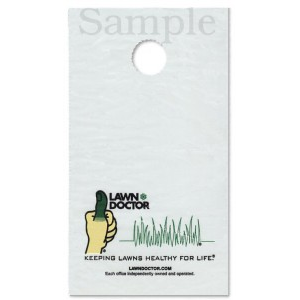 Door Knob Bags feature a round cut-out to hang on outer door handles These are often used to advertise companies with neighborhood advertisements and inserts. We custom manufacture door handle bags in all sizes, thicknesses, and colors. If you would like a custom logo or image printed on the bag, please fill out the quote form below, and give us all the details. Minimum order is 25,ooo and takes about 3 weeks turnaround time. Material Colors: Available in any color. Tear-off Coupon: Attached to bottom of bag. As a provider of custom bags, we understand the importance of representing your brand and product appropriately–in a functional yet stylish fashion. Your packaging acts as marketing materials for your business, and we understand that. Ensure your company is represented the right way with custom options from Excellent Poly. To order, complete the form below or call us at 877.768.6555 for a quote! Customizable: Available in any color, size and thickness. Options: Our bags come in a number of tints and are available to be customized to your needs. Have a company logo you’d like on the bag? We can do that. Have multiple logos you’d like put on the bags? We can do that, too. Efficient: Orders for non-printed bags can be available and ready to ship within days and printed bags within 10 days to 2 weeks. You’ll be amazed at just how quickly Excellent Poly can turn around your order. Our typical lead time for an order is around three weeks, but we are 100% prepared to help when time gets tight with our expedited service. Rush orders for non-printed bags can be shipped in around a week, while printed bags can be prepared as quickly as 10 days to two weeks. If you need a custom design, but don’t have the expertise – don’t worry! We have designers on staff who can assist you in creating the wicketed bag you envision. Call us Toll-Free at 877-768-6555 today! When Do You Need The Bags Delivered? Copyright © 2019 Excellent Poly.